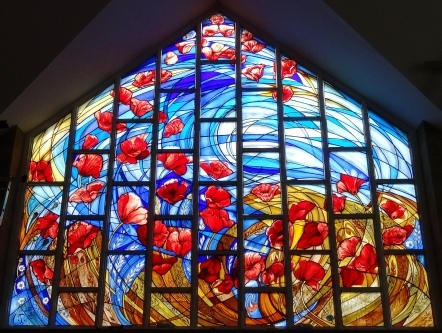 This contemporary stained glass window is in memory of all those who gave their lives and health in the service of others on the centenary of the beginning of the Great War in 1914, and in particular remembrance of the old pupils of St John's School who bravely served their country in this time of need. A Remembrance window to mark the 100th anniversary of the first world war: Poppies rise and swirl above the cornfield into the vast blue sky. Rich in symbolism, cornfield flowers grow up through the ears of corn. The new window transforms the west end of the chapel, making it a more intimate space and better suited to prayer, private contemplation and worship. The poppies become more white as they flow upwards towards heaven, the corn fields and red poppies being a very direct symbol of remembrance but also of rebirth and regeneration, the bread and wine of the Eucharist, and the red symbolic of the Passion. The inscription is the praise from Psalm 23, recalling the Presence of God: “Yea though I walk through the valley of the shadow of death, I will fear no evil; for You are with me”. The Alpha Omega sign is a symbol that includes all our ancestors who have gone before, and stands as a reminder to those who have given their lives for us to have peace and freedom. The new stained glass ‘Remembrance Window’ perfectly complements the colours and dynamic of the eastern window of the ‘Eagle of Saint John’ that was commissioned for the chapel in 2009.